CLEVELAND, Ohio (April 26, 2017) – Business, community and civic leaders with a hunch of how to change the trajectory of poverty in Cleveland now have a powerful new opportunity to make their innovative ideas reality. 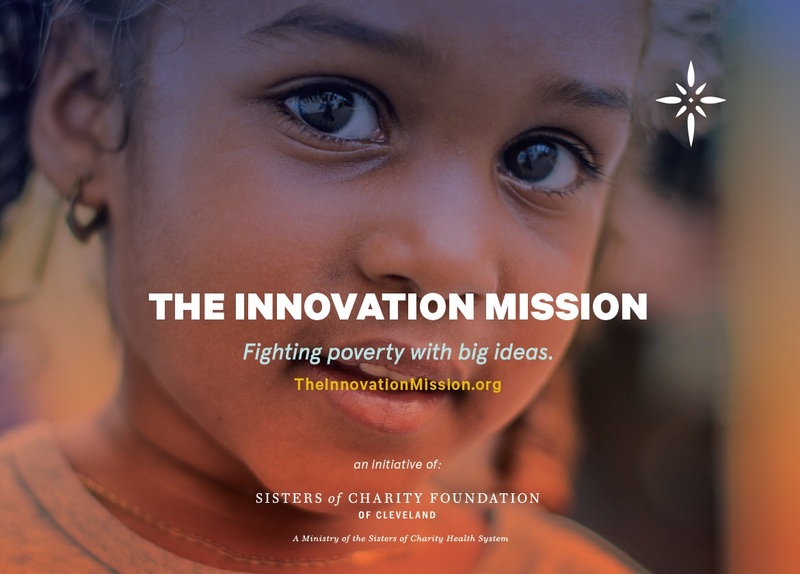 The Innovation Mission: Fighting Poverty With Big Ideas is a ground-breaking initiative of the Sisters of Charity Foundation of Cleveland in collaboration with Cleveland Leadership Center. Applicants are sought from the for-profit, nonprofit and public sectors. The 18-month fellowship allows professionals to keep their jobs, while spending at least 12 weeks turning their idea into a real-life solution. One in three Cleveland residents, including over half its children, live below the poverty level, according to U.S. Census estimates. “While rates have dropped in recent years through the effort of a lot of good work, new approaches are still needed to address long-standing, embedded challenges,” Krey says. Fellowship applications are due July 17. Prospective applicants also have the option to submit a project summary by May 22 if they want feedback before formally submitting an application. The four fellows will be announced in September. Information sessions for interested professionals will be held May 5 and 15, and June 15 and 19 at the foundation offices, 2475 East 22nd Street, Cleveland. More information can be found at www.TheInnovationMission.org. Dennis F. Beatrice, an independent consultant and senior adviser at SRI (established in 1946 by Stanford University as a center of innovation), will lead the professional development component of the fellowship. “It is designed as a comprehensive initiative to help the fellows sharpen their innovative ideas, work together to improve them, and prepare them to have an impact on Cleveland,” Beatrice says. Though The Innovation Mission is new, fighting poverty with creative big ideas already is happening. These three ideas illustrate the potential of incubating and launching new ideas to tackle the diverse challenges around poverty. Housing First changed the paradigm to solving chronic homelessness for single men and women, and reduced chronic homelessness by 78% in Cleveland, making it a leader in the country. A joint initiative in Cuyahoga County, it operates on the belief that a permanent, safe place to call home is a prerequisite to employment and recovery goals. It now operates 10 permanent supportive housing locations. Housing First addresses the diverse challenges related to the homeless crisis – bringing together housing and human service providers, public-sector systems, the philanthropic community, and advocates for the homeless. In 2001, Boston Medical Center implemented a new idea to solve the problem of nutrition-related illnesses and under-nutrition in low-income patients. Primary care providers write “prescriptions” for the BMC Preventive Food Pantry. Families can fill that prescription twice a month. They receive three to four days’ worth of food, featuring often costly perishable items (fruit, vegetables, and meat). In a single year, the Preventive Food Pantry serves over 80,000 patients and their household members (40 percent of whom are children). In 2012, it earned the James W. Varnum National Quality Health Care Award from Dartmouth-Hitchcock Health System for being an outstanding national leader in health-care quality improvement initiatives. The Boston innovation has grown as hospitals around the country have implemented their own pharmacy-like food pantries. An innovative idea to reduce recidivism in San Francisco came from the sheriff’s department and the unified school district. In 2003, they launched a charter high school inside the county jail. Its mission is to foster learning in adult inmates who often were unsuccessful in traditional education environments. Students spend the day in integrated classes studying for their high school diplomas and discussing the consequences of crime. The model has reduced inmate violence, decreased recidivism, and interrupted cycles of intergenerational incarceration. Today, Five Keys is a nationally recognized nonprofit operating accredited charter schools and programs at 70 locations in California and serving over 8,000 students.